The majority of Americans still value homeownership, but millennials face major challenges in realizing this dream, nearly a decade after the subprime crisis. Homeownership in America has taken a beating in the past few years. Eight years after the subprime crisis, homeownership remains at its lowest level in 20 years, at just over 63 percent. Does this mean the end of the American Dream of owning a home? At first glance, the answer is no. New research from ReportLinker shows that for 80 percent of Americans homeownership remains the best investment a person can make. 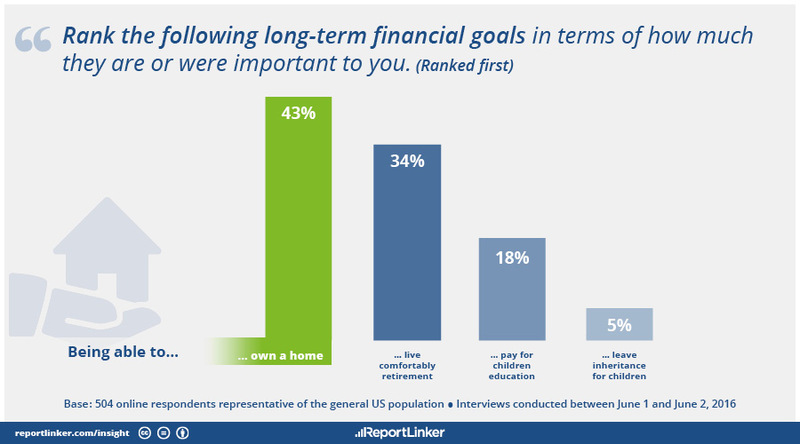 According to the same survey, owning a home is still the number-one, long-term financial priority for nearly 43 percent of Americans, ahead of ensuring a comfortable retirement, paying for their children’s education and leaving an inheritance. 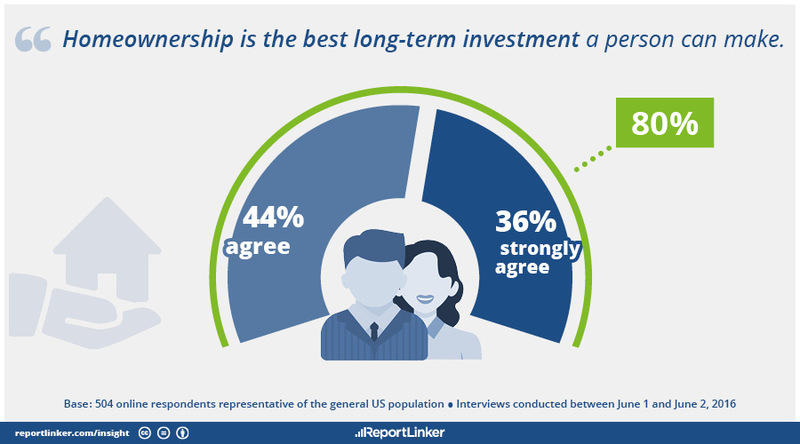 2015 report by Gallup corroborates these figures, showing that real estate leads four others choices as the best long term investment. The problem may stem from the reluctance of young Americans to form a household, one of the main drivers of homeownership. During these economic hard times, the share of U.S. households with more than three generations under the same roof rose significantly, and has remained high. According to the U.S. Census Bureau’s Housing Vacancy Survey, growth in the number of household averaged just 625,000 annually in 2007-2013, compared to 1.5 million in 2015. But does the fact that this decline persists at a time when mortgage rates are at their lowest in 40 years indicate a change in the way Americans view home ownership? But the picture becomes more nuanced when one looks at the importance that Americans assign to homeownership. For the general population, it is ranked in third place behind getting married and achieving educational aims in terms of life achievements in the ReportLinker’s survey. This may indicate a disconnect between the dream of owning a home and the reality of achieving it. A closer look at the numbers shows that this disconnect is felt hardest among millennials. The slowdown in homeownership over the past several years has corresponded with the coming of age of the millennials (born 1985-2004). 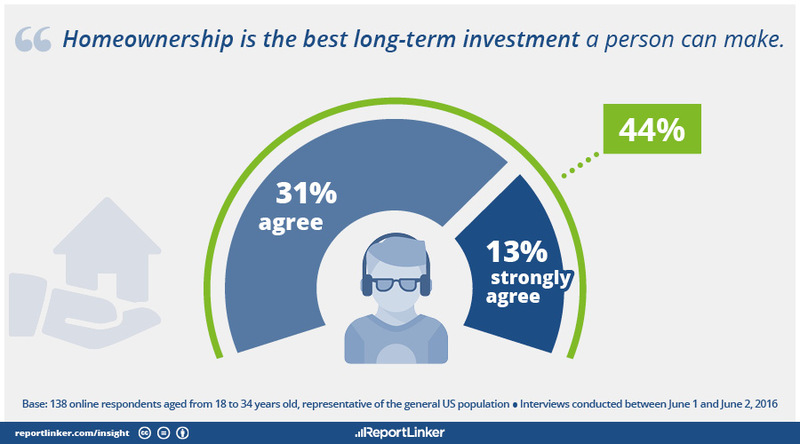 Compared to the general population, only 44 percent of millennials agree that homeownership is the best long-term investment, according to the recent ReportLinker research. This reticence is echoed in other research, which shows that, although the millennials are the largest generation in U.S. history, they have been slow to form households, a key indicator of future homeownership. Over the past 10 years, the number of adults under age 30 has increased by roughly 5 million but the number of households formed in that age group has risen by just 200,000. 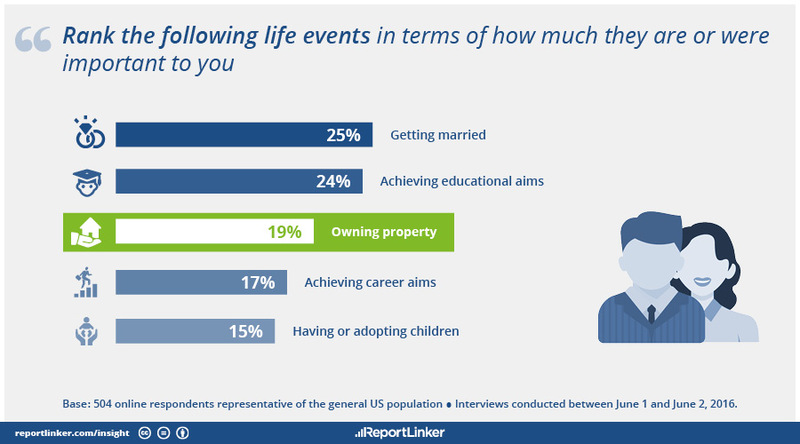 Moreover, homeownership has slipped to fourth place in the list of life achievements, coming after attaining educational and career aims and getting married, in the ReportLinker study. These numbers suggest that, in an era of stagnant incomes and wage inequality, millennials put homeownership on hold while they worked to first ensure their financial security through education and career development. They’ve had to do it in an era of rising wage inequality and stagnation. The decision to form a household is closely linked to income, as the “State of the Nation’s Housing 2016” report released by Harvard University’s Joint Center for Housing Studies shows. For example, households earning under $25,000 annually—the ones that face the biggest financial hurdle to buying a home—were the fastest-growing segment in 2005-2015 and represented 44 percent of America’s net growth in households. When it comes to wage levels, the picture has been similarly morose. Today, with most measures of the labor market signaling full employment in the U.S., wage growth has remained weak. Average wage growth has fluctuated around 2 percent, unadjusted for inflation, between 2002 and 2015, according to a study by the Federal Reserve Bank of San Francisco. While millennials may have borne the brunt of the aftershock of the subprime crisis, it looks like homeownership in this segment is poised to rebound. 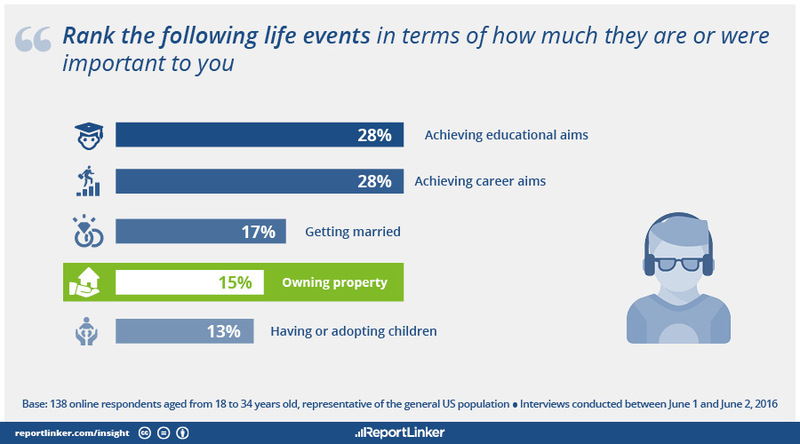 According to ReportLinker’s survey, being able to own property still remains the top priority for millennials, with 46 percent saying it was their top-ranked long-term financial goal (compared to 43 percent for the general population), which indicates pent-up demand. Moreover, nearly a decade has gone by since the subprime crisis and millennials aren’t getting any younger. As they age, they are more likely to form households, the precursor to homeownership. According to the Joint Center for Housing Studies report, millennials are expected to form well over 2 million new households each year on average in the years to come, raising their numbers from 16 million in 2015 to a projected 40 million in 2025. Therefore, it looks like the reports of the death of America’s love affair with homeownership have been greatly exaggerated. And it’s the millennial generation who are coming to the rescue. Hardened by years of lower incomes, wage inequality, living with mom and dad, and renting, they are finally entering the market with big dreams and a clear head. Home values assigned by appraisers were 1.93 percent lower than what homeowners estimated in June, according to the Quicken Loans’ national Home Price Perception Index (HPPI). The difference between value perceptions from appraisers and owners has slightly widened since May, when appraised values were 1.89 percent lower than expected. Home valuations across the country rose in June, as reported by the Quicken Loans Home Value Index (HVI). The average home appraisal increased 0.84 percent since May and enjoyed a 4.47 percent boost since June 2015. The June HPPI shows appraised values are 1.93 percent lower nationally than what homeowners estimated. While this isn’t a large discrepancy, the gap between expected and actual appraisal values grew slightly since May. The perception of home value varies widely across the country. Appraisals show home values higher than owner expectations by as much as 3 percent in Denver but, in contrast, were more than 3 percent lower in Baltimore, Detroit and Philadelphia. Continuing the slow upward march, appraised values rose by 0.84 percent from May to June – as measured by the national HVI. Home values are making stronger annual gains, rising 4.47 percent since June 2015. The regional data shows equally robust growth. Each of the four regions measured displayed modest monthly gains and more meaningful year-over-year growth. The West remains the leader with a 5.84 percent annual increase in appraised value. The Northeast posted the smallest increase with a rise of 2.07 since last year. “Nationally, home value increases are well within the healthy range,” says Walters. “Although, the variances across the country can influence owners’ perception. Owners in the West, where appraised values are rising more quickly, tend to underestimate their home’s value. The opposite is true for those in the Northeast, with appraised values showing slower growth. For more information, visit www.QuickenLoans.com/Indexes. The national housing market has now regained enough momentum to provide an engine of growth for the U.S. economy, according to the latest The State of the Nation’s Housing report by the Joint Center for Housing Studies. Robust rental demand continues to drive the housing expansion, and sales, prices, and new construction of single-family homes are on the rise. Even more important, income growth has picked up, particularly among the huge millennial population that is poised to form millions of new households over the coming decade. At the same time, however, several obstacles continue to hamper the housing recovery—in particular, the lingering pressures on homeownership, the eroding affordability of rental housing, and the growing concentration of poverty. Mirroring the persistent weakness on the owner-occupied side is the equally long surge in rental housing demand, with increases across all age groups, income levels, and household types. With vacancy rates down sharply and rents climbing, multifamily construction is booming across the country. But with strong growth among high-income renters, so far most of this new housing is intended for the upper end of the market, with rents well out of reach of the typical renter making $35,000 a year. Because of the widening gap between market-rate rents and the amounts many households can afford at the 30-percent-of-income standard, the number of cost-burdened renters hit 21.3 million in 2014. Even worse, 11.4 million of these households paid more than half their incomes for housing, a record high. The report finds that rent burdens are increasingly common among moderate-income households, especially in the nation’s 10 highest-cost housing markets, where three-quarters of renters earning $30,000–45,000 and half of those earning $45,000–75,000 paid at least 30 percent of their incomes for housing in 2014. The report notes that a lack of a strong federal response to the affordability crisis has left state and local governments struggling to expand rental assistance and promote construction of affordable housing in areas with access to better educational and employment opportunities through inclusionary zoning and other local resources. Homebuilding rates accelerated in June, surpassing expert forecasts for the month and further fortifying the idea that housing is indeed on the mend. According to the Commerce Department, housing starts rose 4.8 percent from a month earlier to a seasonally adjusted annual rate of 1.189 million in June. However, while both permits and starts improved on a month-to-month basis, the total permits represented a decline of 15 percent compared to last June, and the total number of starts represented a decline of 1 percent compared to last year. Privately owned housing units authorized by building permits in June were at a seasonally adjusted annual rate of 1,153,000. This is 1.5 percent above the revised May rate of 1,136,000, but is 13.6 percent below the June 2015 estimate of 1,334,000. Single-family authorizations in June were at a rate of 738,000; this is 1.0 percent above the revised May figure of 731,000. Authorizations of units in buildings with five units or more were at a rate of 384,000 in June. Single-family housing starts in June were at a rate of 778,000; this is 4.4 percent above the revised May figure of 745,000. The June rate for units in buildings with five units or more was 392,000. Privately owned housing completions in June were at a seasonally adjusted annual rate of 1,147,000. This is 12.3 percent above the revised May estimate of 1,021,000 and is 18.7 percent above the June 2015 rate of 966,000. Single-family housing completions in June were at a rate of 752,000; this is 3.7 percent above the revised May rate of 725,000. The June rate for units in buildings with five units or more was 386,000. For more information visit http://www.census.gov/construction/nrc/index.html. For homebuyers—especially first-time ones—what looms larger and scarier than the prospect of pulling together enough cash for a down payment? A late-stage IRS audit, maybe? A bracing swim in gulper eel–infested waters? All wrong! The answer is nothing. For more and more Americans, the down payment has become the Everest-size mountain they need to climb to reach their dreams of homeownership—or perhaps freeze to death trying. In these days of rising home prices, it seems harder than ever to pull together that mammoth mound of moolah needed to get yourself into a new place. It can lead to desperation. Will you need to resign yourself to a lifetime of living with your parents, renting cramped apartments, or settling for the boondocks of Alaska (where you might be able to afford your own cabin sans running water)? Actually, there is something else you can do: Whip out a calculator and start budgeting. That big lump sum you’re stressing over is a lot less intimidating when you break it down into daily payments. We can help! We looked at the median home listing price in May for the country’s 15 biggest metropolitan areas and the average percentage that buyers in those areas put down on a home. Using those figures, we calculated the typical down payment for each of those cities. We know saving is tough. But it’s also necessary—and not just for the initial costs. “If you haven’t been able to save up enough for a significant down payment, your saving skills may not be up to the task of paying the monthly mortgage, your insurance, your property taxes, maintenance [costs], and what we like to call your emergency fund for emergency repairs,” says Michael Corbett, the TV host of Extra’s “Mansions and Millionaires” and author of “Ready, Set, Sold!” Thanks for the pep talk, Mike! He recommends aspiring homeowners earmark their tax refunds and annual bonuses for their down payment. They can take a part-time job on the weekends or do a little consulting work to sock away those extra shekels. “All of this only helps you toward homeownership if you put that money away,” Corbett says. “A lot of people say, ‘I’m not going to go to Starbucks anymore,’ but they don’t take that $5 or $6 per latte and actually save it.” Hey, do you really need to drink 15 of those things a day, anyway? We thought not. So let’s take a cross-country jaunt and start saving! 1. New York City, N.Y.
Prices in the City That Never Sleeps may make homeowner hopefuls want to pack up and head for cheaper parts of the country. But you’d miss out on the world-class theater, museums, restaurants, and endless career opportunities. The median sale price for those dreaming of a Manhattan address hit a record high of about $1.1 million in the second quarter of 2016, according to the most recent Elliman report. But those willing to buy in the city’s other boroughs—even hipster Brooklyn—as well as surrounding burbs can save bundles. It may feel like you need the salary of a movie star or, at the very least, a Flo-from-Progressive-level commercial actress to afford your own digs in Los Angeles. But fortunately for those not being stalked by the paparazzi, a recent report by the Los Angeles County Economic Development Corp. projects that key employment sectors will add thousands of jobs in the next two years: health care; construction; and professional, scientific, and technical services. And there’s even a booming neighborhood where tech startups and outposts of companies like Google and Yahoo are clustered—it’s known as Silicon Beach. Homes have been flying off the market in this Midwestern metropolis, with prices steadily climbing to about 5 percent higher in May than they were a year earlier, according to a recent report. And why wouldn’t they? A (relatively) laid-back alternative to the coastal cities, Chicago boasts pioneering theater companies, 20 Michelin-starred restaurants, and an increasingly vibrant music scene. It’s the future home of the Obama Presidential Center. And while winters can be rough, come spring Chicagoans enjoy 8,100 acres of parkland—not to mention 26 miles of public beaches. But the secret is out: A recent analysis by realtor.com found that the downtown Loop neighborhood is one of the top 10 neighborhoods in the country for job growth, which is fueling household formation and new construction. Although Dallas is in the middle of oil country, the slump in the price of crude doesn’t seem to be hurting its real estate market—at least, not yet. Home values rose 9.3 percent year over year in May, whereas the national rate was 5.9 percent, according to a recent CoreLogic report. That makes sense as the population of the city has been growing as well (4.1 percent from July 2010 through July 2015, according to the U.S. Census Bureau), helped, no doubt, by the lower cost of living. Major companies are moving in, including Toyota, which is moving its North America headquarters from California to just outside Dallas, in Plano. The suburban city will also be home to the new regional headquarters of Fannie Mae. Houston’s real estate market, on the other hand, got hit much harder by the turmoil in the oil industry. But the number of homes sold began to climb again in May, although year-over-year prices bucked the national trend by staying flat, according to the Houston Association of REALTORS®. Still, the city isn’t all about oil—it’s also home to 26 Fortune 500 companies, and a realtor.com analysis last year found it was one of the top U.S. cities drawing millennial would-be home buyers. Buying a home in the City of Brotherly Love is more affordable than in many of the other big Northeastern cities on this list, but here’s the thing: It doesn’t look like it will stay that way for long. Like the rest of the country, property prices are steadily rising. They jumped nearly 22 percent this year alone, Kevin Gillen, senior research fellow at Drexel University’s Lindy Institute for Urban Innovation, told the Philadelphia Inquirer. “The average Philadelphia home has achieved a new all-time high in value,” Gillen told the paper. But rest assured: It won’t approach New York levels anytime soon. Prices haven’t been rising quite so high in the nation’s capital as of late, and that has a lot to do with the uncertainty surrounding the presidential election, say local real estate agents. After all, whoever wins the Oval Office will determine who is placed in more than a few jobs in the city. That’s a big reason why prices rose just 2.1 percent annually in the area in May. And by the time many aspiring homeowners save up that down payment and purchase a home, Hillary Clinton or Donald Trump might be gunning for a second term—and who knows what sort of impact that will have on real estate values! Miami is known for its nonstop nightlife and Latin culture—the 2010 U.S. Census counted 70 percent of its residents as Hispanic. Located at the tip of the continental U.S., it’s no surprise that it’s known as the Gateway to the Americas, drawing people from across Latin America. The recent restoration of diplomatic ties—and soon, commercial flights—with nearby Cuba is sure to make its impact felt on the place many still call the Magic City. But the number of sales here dropped about 10.4 percent annually in May, according to data from the Miami Association of REALTORS® provided to The Miami Herald. Meanwhile, prices shot up as a strong dollar discouraged foreign buyers from snapping up those luxury condos at the same time that there are fewer foreclosures for investors and flippers to snap up, according to the Herald. Putting down roots in Atlanta, with its lower cost of living, burgeoning film industry, and usually pleasant weather, is still relatively affordable. But it may not stay that way for much longer. The cost of purchasing a residence jumped 6.5 percent in April from a year earlier, above the national average, according to the latest S&P/Case-Shiller Home Price Indices report. That’s largely due to the lack of properties on the market at a time when more companies are moving down to the area, bringing a new crop of future Atlantans with them. Home prices are steadily rising in the birthplace of the American Revolution—at the annual rate of about 5.7 percent in April compared with the same time a year earlier, according to the S&P/Case-Shiller report. That puts it right around the national average. But hold on: Standard & Poor’s predicted in January that Boston home values will jump 24 percent by 2020! While the situation isn’t quite as bad as taxation without representation, lovers of the home of the Red Sox, The Pixies, The Freedom Trail, and Revere Beach, the country’s first public coastline park, should probably get a head start on saving as soon as possible. Holy moly! There’s no easy way to say this: Buying an abode in San Francisco ain’t cheap, so if you’re not well-off, you’d better start playing the lottery now. Some good news: While it remains one of the hottest real estate markets in the U.S., in June we started to see higher-priced homes flying off the market just a wee bit slower than before—perhaps a sign that the tide is finally turning. Still, buyers shouldn’t hold their breath waiting for prices to soften on the city’s “affordable” residences. It might be a better plan to work on creating the next Snapchat. How hard could it be? Buying a home in the former automotive manufacturing hub won’t set buyers back too much these days. Also, according to our calculations, it’s one of the U.S. cities where you can pay your mortgage off the fastest. Even so, interested buyers might want to get moving sooner rather than later. In recent years, Detroit has been experiencing a resurgence as more startups, shops, and restaurants are moving in. That’s likely to lead to higher prices, so cash-strapped buyers should buy a home while they still can. Plenty of buyers may still be able to swing the home prices in Arizona’s capital area, but they are going up—prices rose about 5.5 percent, according to the S&P/Case-Shiller report. Still, you’ll get more bounce for the ounce than elsewhere. Our analysis found that Phoenix-area municipalities of Gilbert, Chandler, and Scottsdale offer some of the largest homes in America, and they’re likely to be relatively new construction as well. Speaking of Gilbert, it also made our list of boom towns with notable job growth, while Chandler is home to the satellite offices of several major tech companies. Home prices here have been rising far faster than the national average. Seattle prices shot up 10.7 percent in April compared to the same time a year earlier, according to the S&P/Case-Shiller report. Bidding wars have also been driving up the cost of homeownership, as about three-quarters of Seattle-area residences have been receiving multiple offers, according to a recent Seattle Times article. In a testament to how crazy it’s become, last month, more than 100 people were lined up, some of them having slept there overnight, to plunk down deposits on condos that haven’t even broken ground yet, according to the Times. Even in the reasonably priced twin cities of Minneapolis and Saint Paul, prices rose 5.7 percent year over year in May—hitting their highest levels since well before the housing bubble burst in June 2006, according to the latest Minneapolis Area Association of REALTORS® report. And they can only be expected to keep on climbing. This post was originally published on REALTOR.com. Homes in gated communities command significantly higher prices – almost $30,000 on average – but these neighborhoods’ additional amenities can also reduce sale prices because they bring maintenance costs that outweigh the benefits of the amenities, according to recent research published by the American Real Estate Society (ARES). “This study provides clear evidence that homes in gated communities sell at a premium relative to comparable homes in non-gated communities,” said ARES Publication Director Ken Johnson, Ph.D., real estate economist at Florida Atlantic University’s College of Business and co-developer of the Beracha, Hardin and Johnson Buy vs. Rent Index. Johnson refers to a study published by ARES in the Journal of Real Estate Research, conducted by professor Evgeny L. Radetskiy, Ph.D., of La Salle University and professors Ronald W. Spahr, Ph.D., and Mark A. Sunderman, Ph.D., of the University of Memphis. The study examined a sample of 11 gated communities and a sample of matched non-gated properties, using a data set of housing sales in Shelby County, Tennessee. The researchers found that residential properties in gated communities command a noticeable price premium of approximately $30,000, most likely resulting from actual or perceived benefits associated with additional privacy, homeowner associations’ tighter controls on maintenance, home design and the added assurances against crime and other undesirable activities. For more information, visit www.fau.edu. The spring buying season continues to cruise along throughout most of the country, according to Freddie Mac’s recently released Multi-Indicator Market Index® (MiMi®). Two additional metros—Charlotte, N.C., and Knoxville, Tenn.—entered their benchmark ranges. The national MiMi value stands at 84.1, indicating a housing market that’s on the outer range of its historic benchmark level of housing activity, with a +0.27 percent improvement from March to April and a three-month improvement of +1.63 percent. On a year-over-year basis, the national MiMi value has improved +7.37 percent. Since its all-time low in October 2010, the national MiMi has rebounded 42 percent, but remains significantly off from its high of 121.7. Thirty-six of the 50 states plus the District of Columbia have MiMi values within range of their benchmark averages, with the District of Columbia (102), Hawaii (97.4), Utah (95.9) and Colorado, Montana and Oregon all having the same value (95.8) and being closest to their benchmark averages. Sixty-seven of the 100 metro areas have MiMi values within range with Nashville, Tenn. (99.9), Honolulu, Hawaii (99.8), Salt Lake City, Utah (99.0), Los Angeles, Calif. (98.6) and Austin, Texas (102.6) ranking in the top five. The most improving states month over month were Mississippi (+1.29%), Tennessee (+1.27%), Massachusetts (+1.15%), Florida (+0.98%) and Nebraska (+0.97%). On a year-over-year basis, the most improving states were Florida (+15.34%), Colorado (+14.73%), Nevada (+14.62%), Oregon (+14.46%) and New Jersey (+13.48%). The most improving metro areas month over month were Lakeland, Fla. (+2.06%), Chattanooga, Tenn. (+2.04%), Modesto, Calif. (+1.83%), Orlando, Fla. (+1.82%), and New Haven, Conn. (+1.78%). On a year over year basis, the most improving metro areas were Orlando, Fla. (+20.17%), Tampa, Fla. (+17.47%), Denver, Colo. (+17.39%), Cape Coral, Fla. (+16.69%), and Portland, Ore. (+15.99). In April, 42 of the 50 states and 86 of the top 100 metros were showing an improving three-month trend. The same time last year, 46 of the 50 states, and all of the top 100 metro areas were showing an improving three-month trend. “Seven years into the recovery from the Great Recession most of the nation’s housing markets remain below their historical benchmarks, but continue to grind higher month-by-month,” says Freddie Mac Deputy Chief Economist Len Kiefer. “Nationally, MiMi in April 2016, is 84.1, a 7.37 percent year-over-year increase and the 48th consecutive month of year-over-year increases. Over this four-year timeframe, MiMi has increased 36.5 percent and now stands just 15.9 percent below its historic benchmark average. “Out of the 50 states and the District of Columbia 49 posted positive year-over-year changes. North Dakota and Wyoming, two states heavily reliant on the energy sector, were the only states with year-over-year declines. Out of the 100 metro areas MiMi tracks, 99 posted positive year-over-year gains, with Tulsa, Oklahoma — also with deep ties to the energy sector — posting no change year-over-year. For more information, visit www.FreddieMac.com/mimi. Existing-home sales sprang ahead in May to their highest pace in almost a decade, while the uptick in demand this spring amidst lagging supply levels pushed the median sales price to an all-time high, according to the National Association of REALTORS®. All major regions except for the Midwest saw strong sales increases last month. Total existing-home sales, which are completed transactions that include single-family homes, townhomes, condominiums and co-ops, grew 1.8 percent to a seasonally adjusted annual rate of 5.53 million in May from a downwardly revised 5.43 million in April. With last month’s gain, sales are now up 4.5 percent from May 2015 (5.29 million) and are at their highest annual pace since February 2007 (5.79 million). Surpassing the peak median sales price set last June ($236,300), the median existing-home price for all housing types in May was $239,700, up 4.7 percent from May 2015 ($228,900). May’s price increase marks the 51st consecutive month of year-over-year gains. Total housing inventory at the end of May rose 1.4 percent to 2.15 million existing homes available for sale, but is still 5.7 percent lower than a year ago (2.28 million). Unsold inventory is at a 4.7-month supply at the current sales pace, which is unchanged from April. The share of first-time buyers was 30 percent in May, down from 32 percent both in April and a year ago. First-time buyers in all of 2015 also represented an average of 30 percent. According to Freddie Mac, the average commitment rate for a 30-year, conventional, fixed-rate mortgage inched backward from 3.61 percent in April to 3.60 percent in May, which is the lowest since May 2013 (3.54 percent). The average commitment rate for all of 2015 was 3.85 percent. Properties typically stayed on the market for 32 days in May (39 days in April), which is below a year ago (40 days) and the shortest time since NAR began tracking in May 2011. Short sales were on the market the longest at a median of 103 days in May, while foreclosures sold in 51 days and non-distressed homes took 30 days. Forty-nine percent of homes sold in May were on the market for less than a month – the highest percentage since NAR began tracking. May inventory data from Realtor.com® shows that the top five metropolitan statistical areas where listings stayed on the market the shortest amount of time were San Francisco-Oakland-Hayward, Calif., and Seattle-Tacoma-Bellevue, Wash., both at a median of 25 days; San Jose-Sunnyvale-Santa Clara, Calif., 26 days; and Denver-Aurora-Lakewood, Colo., and Vallejo-Fairfield, Calif., both at 30 days. Earlier this month, NAR released a new survey looking at the home buying opportunities of student debt borrowers who are current in their repayment. The findings affirmed the notion that repaying student debt is a contributing factor to the low homeownership rate among young adults and the underperforming share of first-time buyers. Nearly three-quarters of non-homeowners in the survey believed that their student debt is delaying them from buying a home, with most of them citing not being able to save for a down payment as the primary reason. All-cash sales were 22 percent of transactions in May, down from both 24 percent in April and a year ago. Individual investors, who account for many cash sales, purchased 13 percent of homes in May, unchanged from April and down from 14 percent a year ago. Sixty-three percent of investors paid cash in May. Distressed sales– foreclosures and short sales – declined to 6 percent of sales in May, down from 7 percent in April and 10 percent a year ago. Five percent of May sales were foreclosures and 1 percent were short sales. Foreclosures sold for an average discount of 12 percent below market value in May (17 percent in April), while short sales were discounted 11 percent (10 percent in April). Single-family home sales increased 1.9 percent to a seasonally adjusted annual rate of 4.90 million in May from 4.81 million in April, and are now 4.7 percent higher than the 4.68 million pace a year ago. The median existing single-family home price was $241,000 in May, up 4.6 percent from May 2015. Existing condominium and co-op sales rose 1.6 percent to a seasonally adjusted annual rate of 630,000 units in May from 620,000 in April, and are now 3.3 percent above May 2015 (610,000 units). The median existing condo price was $229,600 in May, which is 6.0 percent above a year ago. May existing-home sales in the Northeast increased 4.1 percent to an annual rate of 770,000, and are now 11.6 percent above a year ago. The median price in the Northeast was $268,600, which is 0.1 percent below May 2015. In the Midwest, existing-home sales dropped 6.5 percent to an annual rate of 1.30 million in May, but are still 3.2 percent above May 2015. The median price in the Midwest was $190,000, up 4.8 percent from a year ago. Existing-home sales in the South expanded 4.6 percent to an annual rate of 2.28 million in May, and are now 6.5 percent above May 2015. The median price in the South was $211,500, up 5.9 percent from a year ago. Existing-home sales in the West jumped 5.4 percent to an annual rate of 1.18 million in May, but are still 1.7 percent lower than a year ago. The median price in the West was $346,900, which is 7.7 percent above May 2015.